Guard had kept Roberts happy by telling her he planned to sell the hare in America and give the proceeds to an animal rights group. They would need someone to act as the public face of their discovery, however, and Guard promised Compton £1,000 if he'd agree to take that job on. Presumably, he feared that his own connection with Roberts and the inside information she'd revealed would otherwise come out - and that was something he couldn't allow. “He said to me ‘Eric, I want you to handle all the television and radio’,” Compton explained. “ ‘I'll pay you £1,000 for doing that. ’ I think John was going to prime me to say how it was - other than his being with Veronica Roberts, because she was going to be out of it. [...] There's a lot that he wanted to keep hidden.” By that time, though, no promise of cash could persuade Compton to continue, and he dropped out of the whole thing with no payment at all. Over 25 years had passed since these midnight digs when I spoke to Compton, so it's hardly surprising he could no longer recall the exact dates involved. Piecing the other evidence together, though, the most likely time seems to be early 1981. That would place Guard and Compton's own Spring Equinox visit in March of that year, well after the Sunday Times clue was published. It may also explain why Mike Barker noticed only the faintest depressions near the cross in January 1982. If I'm right, the ground Guard and Compton excavated would have had almost a year to recover by then, helping to disguise the fact that it had ever been disturbed. 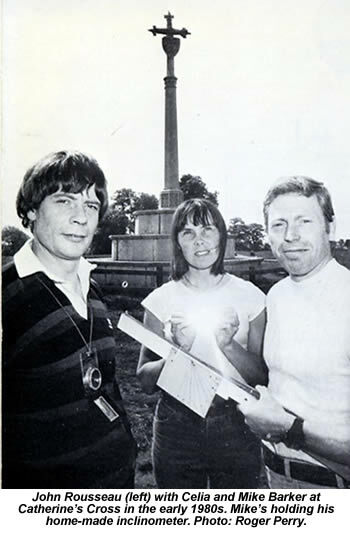 Barker returned to Ampthill Park himself on February 18, 1982 - just over a month before the Spring Equinox - and this time, he brought a home-made inclinometer with him. Armed with this device, he was able to narrow his target area down to a much more manageable size, marking it clearly during daylight hours and then returning after dark to dig. After two or three hours of exhausting digging, Barker gave up and decided to return on the day of the equinox itself to see where the cross's real shadow would fall at twelve noon. Two big holes had now been dug at what was clearly Williams' chosen spot, and yet still the hare remained undiscovered. The next development would surprise everyone.